Features: JVC stereo with factory antenna, jack, and spare tire. Brakes: Front: disc with larger calipers, pads, hubs and spindles. This former dry Texas car has a 2.0L fuel injected 4-cylinder engine that purrs when it runs, and has benefited from a professional servicing from Classic Showcase. The Red exterior with Black interior has been refreshed in recent times, with 1973 being the final year in which Chrome Bumpers and Round Tail Lights were used on these models. The chassis is that of the 2-carburetor 2002 tii and includes stiffer springs, front and rear anti-sway bars, larger 10.0-inch front disc brakes (9.5 on the 2002), and 5.0-inch (0.5-inch wider) wheels. In the driveline the tii has a slightly closer ratio 4-speed gearbox (first gear is 3.74 instead of 3.84); a stronger clutch and a longer (3.45 compared to 3.64) axle ratio to increase top speed; larger exhaust valves with the half-point higher compression ratio and the increased capacity exhaust system that all make their contribution to the increased power, but the fuel injection is the feature attraction. It is a mechanical system made by Kugelfischer, a firm with long experience in supplying injectors for BMW factory sedan racers, and it operates with a plunger pump which supplies fuel to nozzles in the intake ports. The pump is timed so that each of the four nozzles squirts a shot of fuel directly into its combustion chamber when its intake valve is open. For air delivery, each port is connected to a cast aluminum plenum chamber via a curved rubber ram tube and it would appear that the higher speed of the torque peak is due to the tuning length of the tubes. This beauty comes complete with owner's manual and receipts. The BMW 2002tii was the high performance, fuel injected, limited edition of BMW's 2002 automobile model line. It was a two-door sports sedan based on the four-door BMW 1500 of 1961. The 2002tii is considered by many to be the most desirable '02 produced by BMW and imported to the United States. Compared to a standard 2002, a tii offers greater performance and overall value. 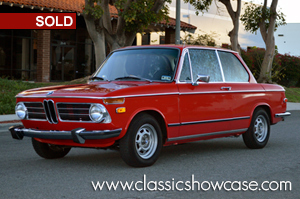 Thus, a 2002tii is usually worth more, and therefore, more highly touted. The 1974 marks the end of production of the tii. Today, German BMW importer Max Hoffman is credited for the car's creation. He had suggested to BMW's engineering director that a 2.0 L engine should be installed into the small two-door 1600-2 to improve performance and emissions. The engineering director argued that the larger motor would not fit, but Hoffman countered that it would. Hoffman would personally take a car with the new engine to Georg Meier, a famous motorcycle racer, for installation. Almost immediately, this brought action, and the resulting 2002 (named after the new motor's displacement) was popular in its first year on sale stateside.